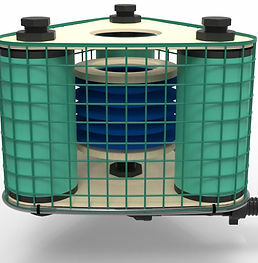 The 4KPPB floating oil skimmer is made from polypropylene and PVC which are heat and acid resistant. As the rest of our range of skimmers, the 4KPPB is a lightweight oil skimming unit designed to skim oil and sludge and other floating contaminants from any body of liquid, i.e tanks, ponds, streams and in restricted areas. Our polypropylene oil skimmers are manufactured from materials designed to withstand high water temperatures, a wide variety of solvents including hydrocarbon-based materials as well as salt, caustic solutions and a variety of strong acids. 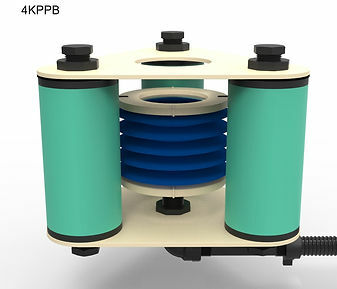 This model, the 4KPPB floating oil skimmer comes complete with a self-adjusting concertina floating head designed for use in rough water. The concertina is made from polypropylene fabric that has a rigid circular floating weir at its apex. Water is drawn down over the floating weir and the concertina contract to allow the water drawn to match the pumps suction. The effect of the flexibility of the concertina is that a constant skim is maintained even in water that has waves or is otherwise disturbed. The depth to which the weir top of the concertina (or head) goes below the surface of the water is known as the “cut”, the less the amount being pumped the finer the cut. The Polypropylene floats are are welded and sealed with a 1” BSP cap. Water is used as ballast to stabilise and hold the skimmer at the required depth. The pipes and fittings supplied with this unit are made from polypropylene. For proper operation, it is best to install the skimmer so that it floats reasonably evenly in the water without the influence of the suction hose pulling it into an uneven position. To help achieve this outcome we have included 1.2 meters of reasonably flexible hose and fittings that should be fastened to the skimmer at the skimmer outlet, this hose can then be connected to your suction. If your suction hose tends to want to sink we suggest that you place a float at the connecting point to keep the connection at or near the surface of the water. The 4KPPB Micro Oil Skimmer is designed to skim oil and other floating materials from the surface of liquids. By limiting the amount of water drawn over the weir the concentration of contaminant compared to water will become greater. 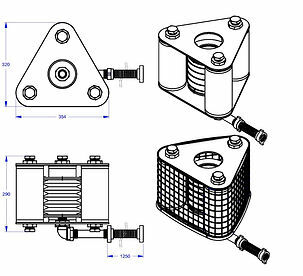 It is also desirable to use a pump that works within the parameters of the 4KPPB skimmers design, if this can’t be achieved, a water bypass valve to reduce the intake of water over the weir at the head of the skimmer should be installed. When the skimmer is at rest in the water, ideally the top of the floating weir should be just below either the surface or just barely breaking the surface. Adjustments can be made as needed to lower or raise the floating weir by turning the concertina fitting (at its base) up or down on its mounting which is the threaded outlet.